The tongue consists of a body and root and is attached by muscles to the hyoid bone below, the mandible in front, the styloid process behind, and the palate above, and by mucous membrane to the floor of the mouth, the lateral walls of the pharynx, and the epiglottis. A median fold (frenulum linguae) connects the tongue to the floor of the mouth. 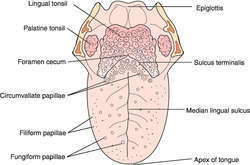 The surface of the tongue bears numerous papillae of three types: filiform, fungiform, and circumvallate (or vallate). Taste buds are present on the surfaces of many of the papillae, esp. the vallate papillae. Mucous and serous glands (lingual glands) are present; their ducts open on the surface. The lingual tonsils are lymphatic tissue on the base of the tongue. A median fibrous septum extends the entire length of the tongue. Arteries: The lingual, exterior maxillary, and ascending pharyngeal arteries supply blood to the tongue. Muscles: Extrinsic muscles include genioglossus, hypoglossus, and styloglossus; intrinsic muscles consist of four groups: superior, inferior, transverse, and vertical lingualis muscles. The hypoglossal nerves are motor to the tongue; the facial and glossopharyngeal nerves are sensory for taste. Nerves: Lingual nerve (containing fibers from trigeminal and facial nerves), glossopharyngeal, vagus, and hypoglossal. Elongation and discoloration (brown, black or white) of the filiform papillae found on the dorsal, middle to posterior third of the tongue. It is associated with alcohol, smoking, toothpaste and mouthwash containing hydrogen peroxide, and liquid aniacids. A tongue covered with a layer of whitish or yellowish material consisting of desquamated epithelium, bacteria, or food debris. The significance of this is difficult to interpret. It may mean only that the patient slept with the mouth open or has not eaten because of loss of appetite. If darkly coated, it may indicate a fungus infection. A tongue that is dry and shriveled, usually indicative of dehydration. It may also be the result of mouth breathing. A tongue possessing a prominent central furrow and lateral branches. A tongue possessing symmetrical whitish patches. A coated tongue on which the surface epithelium appears as a coat of white fur. It is seen in nearly all fevers. Unilateral furring may result from disturbed innervation, as in conditions affecting the second and third branches of the fifth nerve. It has been noted in neuralgia of those branches and in fractures of the skull involving the foramen rotundum. Yellow fur indicates jaundice. A tongue with white raised areas, normal epithelium, and atrophic regions. This condition is also known as benign migratory glossitis. A physical finding in patients with riboflavin deficiency. A dry shriveled tongue seen in typhus. A furrowed and rugated tongue, resembling the skin of the scrotum. A tongue with atrophic papillae. It is characteristic of many conditions, such as anemia and malnutrition. A cleft or bifid tongue resulting from developmental arrest. A tongue in which the anterior end is divided into three parts. The rapid involuntary movement of the tongue in and out. 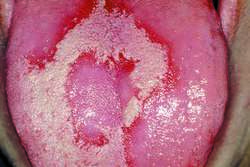 White patch of oral or female genital mucous membrane that cannot be wiped off and cannot be diagnosed clinically as any specific disease entity; in current usage, no histologic connotation.